In 2016, total revenue was $3.3 million; total expenses were $2.2 million. Support for convicted terrorists: The website lists a number of “Political Prisoners” that AFGJ supports. 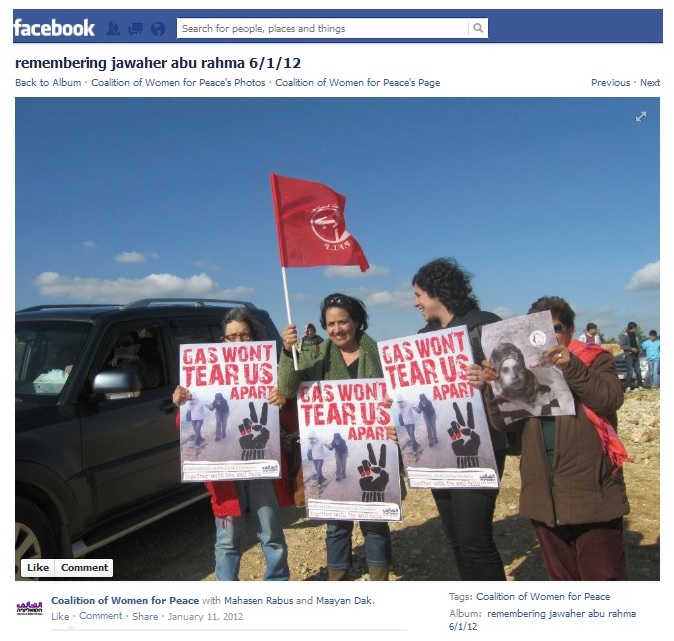 The page lists convicted murders, as well as terrorists affiliated with Hamas, PFLP, Al-Qaeda, FARC, and other groups. A variety of fringe organizations are listed among the national, local and international fiscal sponsorship projects, including Occupy Wall Street, US Labor Against the War, Cindy Sheehan’s Soapbox, and End US Wars. Of 26 “International” fiscally sponsored projects, 9 are radical Israeli and Palestinian NGOs, some of which are involved in violent demonstrations, anti-Israel BDS campaigns, and advocating for one-state formulas that would eliminate Israel as a Jewish and democratic state. Anarchists against the Wall, established in 2003, works “in cooperation with Palestinians in a joint popular struggle against the occupation” with an emphasis on actions against “Israeli apartheid” and the security barrier. Ta’ayush is “a grassroots movement for Arabs and Jews working to break down the walls of racism and segregation by constructing a true Arab-Jewish partnership.” They claim to use “non-violent actions of solidarity to end the Israeli occupation of the Palestinian territories.” These two organizations organize confrontational demonstrations in the West Bank, and are not registered as legal entities in Israel. Neither Anarchists against the Wall nor Ta’ayush publish financial information or staff members, reflecting a lack of transparency and accountability. CWP is a leader in international BDS campaigns against Israel, including through initiating the “Who Profits” project. CWP is involved in campaigns against major Israeli banks, the Elbit and G4S security companies, Ahava cosmetics, and Agrexco produce; in support of the Berkeley divestment vote; and a successful divestment initiative with the Norwegian Government Pension Fund. CWP operates a project with American Friends Service Committee (AFSC) called “Hamushim” (“Armed”) that “works to expose the true human price of the Israeli military industry and arms trade, as well as to mobilize actions against it.” The organization’s activists accuse Israel of selling weapons to dictatorships and countries that suppress human rights in exchange for their sympathetic votes in the UN mechanisms. PSCC has organized protests that have turned violent. Footage of PSCC protests in Hebron, Kfer Qaddum, Nilin, Nabi Saleh, and Beituniya shows protestors hurling rocks, throwing sharp objects, trying to destroy the security barrier, and arson. Supports a “One State Solution” or a “de-Zionized Palestine,” and refers to Israel as having an “ethnicized and racialized Zionist” system. In one chapter, similarities are drawn between BDS campaigns and pre-state Zionist movements in the 1930s and 40s.